BMW is offering the new 2013 BMW M3 Coupe Frozen Limited Edition in three unique exterior finishes just in time for the Presidential election. We aren’t sure why BMW is concerned with the Presidential election here in the U.S., but they have announced the 2013 BMW M3 Coupe will be offered in three new colors, Frozen Red, Frozen White and Frozen Blue. 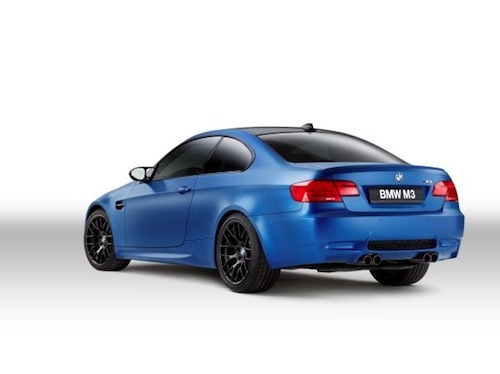 The new 2013 BMW M3 Coupe is called the Frozen Limited Edition. BMW must think that the new colors will help sales here in the U.S. The U.S. luxury sales race is between BMW and Mercedes and it looks like it’s going to be a close finish between the two German automakers. Just like the Presidential race here in the U.S., BMW is also in a tight race with Audi who has been coming on strong here, as the U.S. is a significant piece in the tightening global race. It will be interesting to see if Mercedes-Benz and Audi will offer the same new colors in their performance lines. The new 2013 BMW M3 Coupe Frozen Limited Edition, with red, white and blue exterior finishes won’t arrive here until after the election in November, so we’re not sure of BMW’s marketing strategy here. BMW says the new 2013 M3 Coupe Frozen Edition won’t even begin production until January 2013. The new special edition cars won’t even arrive in time for the Presidential Inauguration on January 20th, 2013. And when the red, white and blue M3 Coupes do finally arrive sometime after the new President has taken office, they won’t be cheap. The base MSRP of the new Frozen Limited Edition will be $76,395 (including Destination and Handling). And only 150 examples of the new U.S. colored cars will be available for US customers. Maybe members of Congress will be attracted to the new colors and can be seen showing their patriotic BMW’s while driving around Washington D.C.
And the interiors will be an extension of the new colors on the outside. The U.S. flag colored M3’s will also get Black Extended Novillo leather with contrast stitching in exterior color on seats, headrests, door inserts, armrests, middle console, and door pulls. They will also feature Carbon leather trim with contrast stitching in exterior color to complete the special cabin motif. On the outside, all Limited Editions will come with Matte black 19” light alloy wheels, Electronic Damper Control, Lowered suspension (-10 mm), and Sport mapping for EDC and DSC. They will also get unique exterior features like High-gloss black kidney grilles, High-gloss black side gills, High-gloss black exhaust pipe tips, six-speed manual transmission and a Carbon fiber roof panel. And patriotic U.S. customers can order their new 2013 M3 Coupe Frozen Limited Edition with a wide selection of optional equipment. A Cold Weather Package M-DCT Transmission, Rear spoiler, Moonroof, Heated Front Seats, Automatic High Beams, Satellite Radio with 1-year subscription, BMW Apps and BMW Individual Enhanced Premium Sound will all be available to order. Members of Congress and other patriotic U.S. citizens can take delivery of their new 2013 BMW M3 Coupe Frozen Limited Edition here in the U.S. at the Performance Center in Spartanburg, SC where drivers can get involved in the BMW M School. Who knows, maybe we’ll see the next President of the United States sporting his new red, white or blue BMW sometime next year.